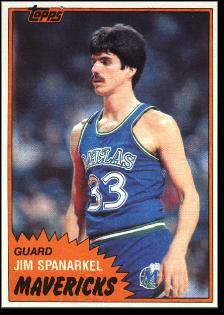 James Gerard Spanarkel was born on June 28, 1957 in Jersey City. He spent much of his free time playing football, baseball and basketball in the park near his home. His father, a salesman for Kellogg’s, mentored his athletic progress and also imparted a solid business sense. Jim attended Hudson Catholic in Jersey City along with Mike O’Koren, who was a year younger. They would become ACC rivals after Jim accepted a scholarship from Duke and O’Koren became a star for the UNC Tar Heels. Jim averaged 13.3 points as a freshman in 1975–76 to win the ACC Rookie of the Year award. He boosted his scoring to 19.2 and developed as a playmaker and rebounder in his sophomore season, and earned All-ACC honors. Everything came together for the Blue Devils in 1977–78. Jim was the floor leader of a team that included center Mike Gminski, forwards Gene Banks and Kenny Dennard, and fellow guard Bob Bender, a transfer from Indiana. Duke won its first ACC Tournament since 1966 and Jim was named tournament MVP. Under coach Bill Foster, the Blue Devils went all the way to the NCAA Final. Jim was named MVP of the East Region as Duke scored close victories over Rhode Island and Penn, and then defeated Villanova to reach the Final Four. After a 90–86 win over Notre Dame in the national semifinal, the great run ended against Kentucky when Jack Givens exploded for 41 points in a 94–88 victory. Jim was named to the All-Tournament Team. With its nucleus intact, Duke was a favorite to reach the Final Four again in 1978– 79, but fell in the NCAA Tournament to St. John’s. That was Jim’s final college game. He finished his college career as the first Blue Devil to score 2,000 points. Although that record has since been eclipsed, he still holds the school record for steals in a season, with 92. Jim was the first draft pick of the Philadelphia 76ers in the 1979 NBA Draft, the 16th player selected overall. The lanky 6–5 frame that enabled him to twist his way to the basket in college was not as great an advantage in the pros. And although he had great coordination and court vision, it did not make up for his lack of quickness compared to other NBA guards. Still, Jim enjoyed considerable success in the pros. After one season in Philadelphia he joined the Dallas Mavericks and scored between 10 and 20 points a game as a starter in 1981–82. After Mark Aguirre, Jay Vincent and Rolando Blackman joined the team, he saw his minutes drop. He played his final season in 1983–84. Jim was prepared to start his business career, but he wasn’t quite finished with basketball. Many thought he would get into coaching. Instead, over the next two decades he juggled his job as a TV analyst (mostly for the Nets) and financial analyst. He enjoyed great success in both endeavors.